Ever think something is out of your reach, but don’t care and decide to go for it, even if it only means failing? Well todays gifts was one of those moments. Last year I considered reaching out to this same company, only to chicken out. This year I decided to go for it, figuring if they said no, it would be disappointing, but if they said yes, it would be amazing. Taking the chance paid off and Susan Nichole Vegan Handbags were willing to participate in our 12 Days! How I discovered Susan Nichole initially has escaped my memory banks, though I am sure one of the pages I follow on Facebook posted about her. Oddly enough, I typically hate purses! My mom has bought me many over the years only for them to be donated. I prefer pockets and if I am not wearing any, I use my husbands. With that said, you can imagine my surprise when I fell in love with the LOVE bag in purple and bought it for myself as a birthday gift a few years back. I still don’t use it all the time, but some days I will admit a purse is useful. The best part is, I always get compliments on how cool it is. 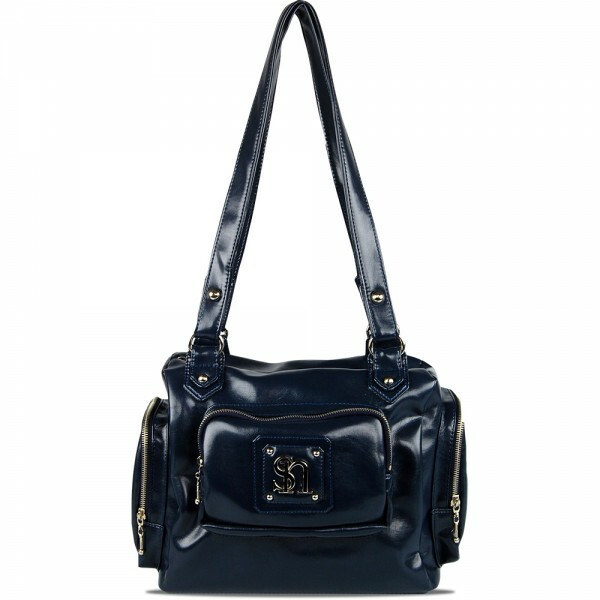 Susan Nichole has given us a Stella Bag in navy to give away. It has a handful of cool compartments to keep things organized. It is big enough to hold a tablet, and it’s vegan! The information for entering is at the end of this post. In case you aren’t familiar with Susan Nichole, you should definitely start following her either on Facebook or Twitter so that you may take part in the Thursday giveaways. I have participated in a few. Despite the fact that I have never won, they are pretty fun. Get more information on winning free stuff from Susan Nichole here. Plus, once you subscribe you will receive insider emails about specials. I participate in her Thursday giveaways, too! What a dream it’d be to win! Merry, merry Christmas!! I started following Susan Nichole several months ago & I think the Stella is the cutest bag I have seen so far. I would love to have one! This is awesome! Susan Nichole bags are the best I’ve ever seen. I only wish I had money to buy at least one. i participate in the thurs contests also but would def love to win through this blog! maybe my chances will be better! thanks for the chance! Love their stuff! I have their Giselle bag in Mustard and get soooo many compliments on it! I love Vegan handbags and susan nichole ROCKS!!! been following her for almost a year!! Thanks for the chance!! What an incredible purse and amazingly creative designer!! I participate too but have never won yet! I’ve also entered (but never won) her contests. Sure is exciting to enter though. Her purses are so pretty. Its too bad they aren’t available at stores. I think a good vegan option should be available to a mass market. I love Susan Nicole handbags. I won once and it is my favorite bag. She has awesome giveaways. Thanks Susan Nicole for all you do for us. Their bags are beautiful! Thanks for the chance to win one!